Second Avenue at Broadalbin: The center of the project to provide new pavement, sidewalks, trees, overhead lights and more. Albany is about to launch its biggest urban renewal project yet, an $8 million reconstruction of downtown streets that starts with a public open house on May 18. The first phase of the downtown “streetscape” project — reconstructing streets and underground utilities surrounding the Albany Post Office — was mostly completed during the winter. City Engineer Stacy Belcastro told me she understands the post office plans to put back its drive-by mail drop on First Avenue once the final paving is done. Phase 2 will tear up and repave downtown portions of Second and Third avenues and their cross streets. (The details are in a memo to the council here.) Demolition and underground utility work will be done mostly at night. New sidewalks, curbs and so forth will be built one block at a time. But the final paving will likely take place in bigger segments. 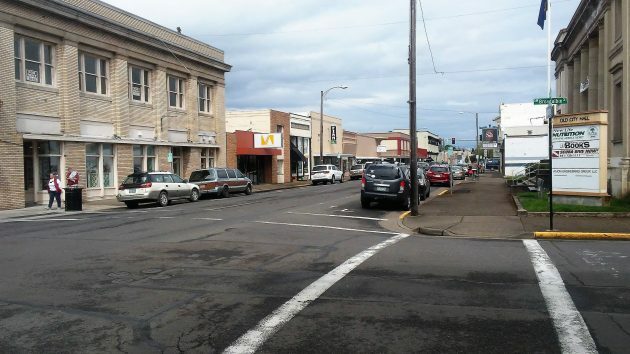 Belcastro told the council Wednesday that ODOT had agreed to increase its contribution to the project so that by the end, the sidewalks on Ellsworth and Lyon streets, the Highway 20 couplet downtown, will be fully compliant with the requirements of the Americans with Disabilities Act. Before the construction gets going, perhaps CARA ought consider an old-fangled Fun House on the corner of 2nd and Ferry. The typical Hall of Mirrors inside the Fun House is a highlight, serving as a perfect metaphor. Perhaps incorporate “This Old Church” as an addendum to the Fun House. The metaphorical possibilities of linking “This Old Church” with a not-for-profit Fun House are simply divine, especially downtown.